The music of Molly Hamilton, Robert Earl Thomas, and their small fraternity of collaborators has this fantastic ability to make its listener tip their head down and gaze into their shoes with earnest attention. 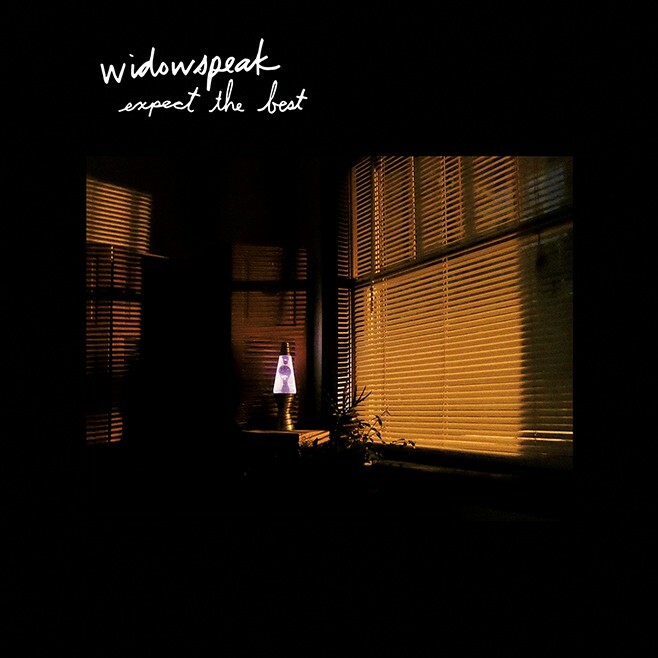 As with other Widowspeak albums, melancholy and longing are the dominant motifs, and as a consequence a melancholic and forlorn body position is assumed for the first few tracks of this, their latest full studio album, Expect the Best. However, go a few tracks in and the album does a small juke move, pivoting to trick the listener into a little bit psychedelic playtime. “Dog,” a song near the middle of this nine track, thirty-six-minute album examines the life of a pet, with a loose parallel to the human condition, and a sort of jealousy towards the simple life of a creature who’s Zen comes from doing as it’s told. Though this song is a real bottom-lip jutter, it introduces the listener to a surrealism that gets pushed as the album progresses. The next song, “Warmer” fully embraces the trip to Weirdsville in a thrusting hippie-freakout anthem that effectively snips the weight on the listener’s nose, letting them drift up to the ceiling for a bit. Of course, like any high, a bum-out is inevitable, and the next song sees the return of Hamilton’s dreary but dominant vocal trail-offs, the musical equivalent of going limp in the slipstream of overwhelming emotion. And so the album hits emotional highs and lows. One track pushing the listener up, then next bringing them down. Expect the Best stands out in the crowded trippy-sad-folksy-shoegazer-pop-rock genre in part because of Hamilton’s lyricism. The song “Good Sport” examines the life of a loner or outcast with the help of sports metaphors, something you don’t see much in the nebbish genre she works in. “Never been a good sport, you can’t ask me to play. Drop the ball in my own court, and just walk away.” Despite the bleak outlook represented by the lyrics, the subversive word-play elicits a kind of justification, as if to say that the narrator of the song can eschew the sporting lifestyle and its jargon because she has something of her own: wit. There are a lot of intentional winks to the audience throughout the album, the song “Right On” starts with the line, “Easy won’t do it” and continues with chipper zingers like, “Thought about – cutting out… Not fighting the current.” These lyrics are juxtaposed against the chillest of phrases: “Right on,” and its repetition in a guitar-medley-enhanced chorus. What Hamilton seems to be saying to the audience when she does this is that she knows that the listener knows that the empty phrases and clichés of our popular lexicon fail to convey the complexity of human emotion when spoken out loud. So, she imbues a layer of irony over what she’s saying, which the audience is hip too on account of the downcast vocal inflection, among other clues. As stated earlier, the album is short, barely over a half hour. This is probably a good thing; the songs are tight and don’t linger, which is a positive trait in music that leans towards depression. A few tracks are out now; the rest will arrive with the album on August twenty fifth.